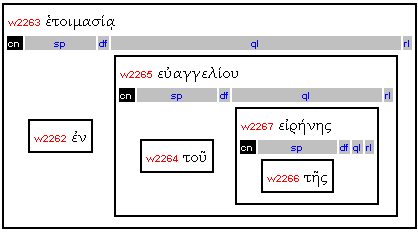 the relationships between the words οἱ (“the”) and πατέρες (“fathers”); τά (“the”), τέκνα (“children”), and ὑμῶν (‘your”); and ἐν (“with”), παιδείᾳ (“discipline”), καί (“and”), νουθεσίᾳ (“instruction”), and κυρίου (“of the Lord”) are all not accounted for at the clause level annotation. The grammatical relationships among these words were not overlooked, but rather accounted for at a separate level of annotation, which we call the word group annotation. In fact, the word group annotation gives an account for the relationship of every word to one another, if there is one. The explanation below is meant to be a companion article to the guide through the OpenText.org clause annotation process, designed to guide you through the word group annotation process. The easiest way to approach the word group annotation is to use the clause annotation as a starting point. So, I will first demonstrate how the word group annotation works in light of the clause annotation before taking a step back to explain the underlying framework for how the two levels fit together. The majority of clause components consist of one word word groups. These do not require further annotation as they are usually head-terms (unless we have ellipsis of the head-term). So, the first step in annotating word groups is to look for clause components that contain more than one word. With multiple word word groups, the first nominal (i.e., a noun or a word that functions as a noun) that is in the proper case for the clause component it is in is usually the head-term. (This rule is slightly modified when prepositions are involved: the proper case for the nominal would be the proper case that the preposition involved governs.) For instance, the first nominative nominal in a subject clause component is usually the head-term for the word group that makes up that component. The first accusative nominal in a complement clause component that functions as the direct object of the clause is usually the head-term for that word group. Any articles or prepositions that precede those nominals are usually specifiers to them. Adjectives or subsequent nominals that further define the head-term are definers. Nominals in the dative or genitive case that further constrain the scope of the head-term are qualifiers. Prepositions that modify the head-term are relators. So to reuse the example from Eph 6.4, we only need to pay attention to the addressee clause component and complement clause component in Eph.c6_7. The first nominal that is the proper case for an addressee (vocative or nominative) is πατέρες. The word that precedes that nominal is οἱ, an article. So, the relationship between the words οἱ (“the”) and πατέρες (“fathers”) is that of a specifier (sp) to a head-term. The main word that makes up the peripheral clause component, addressee, is πατέρες. The article οἱ classifies the “fathers” involved as the generic group called “fathers,” i.e., everyone who falls under the category of fathers. The first nominal that is the proper case for a complement that is the direct object in a clause is the accusative nominal τέκνα. The word that precedes that nominal is τά, an article. The word that follows is a genitive pronoun, ὑμῶν . So, the relationship of the words τά (“the”), τέκνα (“children”), and ὑμῶν (‘your”) is that of specifier, head-term, and qualifier. The main word that makes up the complement clause component is τέκνα The article classifies the “children” involved as the generic group called “children,” i.e., everyone who falls under the category of children while the qualifier ὑμῶν limits the scope of the children to “your” children. Since the first four examples of multiple word word groups do not illustrate anything new, I will leave it to you, my readers, to work out their correct annotation. We will only analyze the fifth and last multiple word word group, ἐν ἑτοιμασίᾳ τοῦ εὐαγγελίου τῆς εἰρήνης (“with the preparation of the gospel of peace”) in the adjunct clause component of Eph.c6_42. The first nominal of the proper case (in this case the dative case that the preposition ἐν governs) is ἑτοιμασίᾳ. The word that precedes this nominal is a preposition, ἐν. The words that follow are two nouns preceded by their own articles (one article per nominal and associate each article with the immediately following nominal of the same case, number, and gender). So, the head term of ἐν ἑτοιμασίᾳ τοῦ εὐαγγελίου τῆς εἰρήνης is ἑτοιμασίᾳ, which is specified by the preposition ἐν and qualified by the nominal εὐαγγελίου. The qualifier εὐαγγελίου, however, is in turn specified by the article τοῦ and qualified by the nominal εἰρήνης. The qualifier to the qualifier, εἰρήνης, is in turn specified by the article τῆς. There are actually two word groups joined by a καί in ἐν παιδείᾳ και νουθεσίᾳ κυρίου. The first head-term is παιδείᾳ (“discipline”), which is specified by the preposition ἐν (“with”). The καί coordinates παιδείᾳ with the second head-term νουθεσίᾳ (“instruction”), which is likewise specified by the preposition ἐν (“with”). This second head-term νουθεσίᾳ is qualified by κυρίου (“of the Lord”). By virtue of the coordination of καί, it is best to see both head-terms sharing both the specifier ἐν and the qualifier κυρίου. Because of some technical difficulties with annotating shared components across word groups, conjoined word groups such as these are annotated as coordinated, but their shared components are not explicitly identified as of this initial version. The two main words that make up the adjunct clause component are παιδείᾳ, “discipline,” and νουθεσίᾳ “instruction.” The preposition ἐν specifies the adjunct as a means in relation to the process expressed by the predicator, ἐκτρέφετε, “bring up.” The qualifier κυρίου (in turn made specific by “the”) constrains the scope of both the discipline and the instruction. So, the discipline and instruction enjoined is that which its constrained by the Lord. It is no accident that the clause and word group annotations fit together so well. We recognize two basic levels of grammatical structures above the individual word—the clause and word group. A Greek clause is, in fact, made up by word groups, not just individual words. In addition, just as the clause consists of a combination of functional components, so also the word group consists of a combination of functional components. Grammatical structure and grammatical function correspond significantly. The grammatical function of a clause component like subject, predicator, complement, or adjunct is carried out by discrete words or groups of words. In other words, you will never find half a word or half a group of related words functioning as subject and the other half of the word or of the group of words functioning as a different clause component. Individual words are often insufficient to fulfill the function of a clause component—hence groups of words that modify the semantic or grammatical function of the individual words are used. In fact, words will either occur singly or as a grouping with a single head-term and one or more dependent words that modify the meaning or function of the head-term. In others words, sometimes words form groups of one—the one word is sufficient to fulfill its function as a clause component—and sometimes words form groups with one head-term and one or more modifiers. Moreover, while frequently a clause component is made up by a single word group, often it is made up by a series of word groups conjoined together.